After Ferguson area schools announced they would be closed Tuesday in anticipation of the grand jury decision on Officer Darren Wilson, Ferguson Library announced that it would be open and available to students, staff, and other community members. Almost immediately, inspired Twitter users sprung into action posting the link to the library's homepage where people could donate. Just donated $10 to the #ferguson #library - http://t.co/Va7RihlTM9 - You can, too. There&#x27;s a #donate button right on the website. 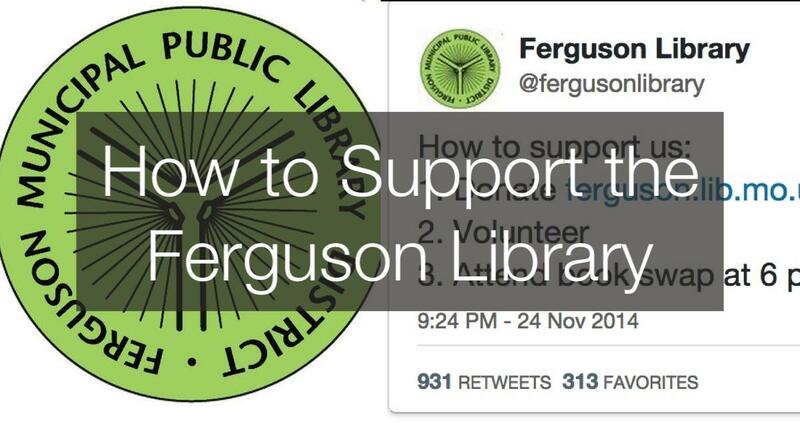 Just donated $10 to the #ferguson #library - http://t.co/Va7RihlTM9 - You can, too. There's a #donate button right on the website. Then, in the hours after the grand jury decided not to indict Officer Darren Wilson for the death of Michael Brown, Ferguson Library received a flood of tweets requesting book and monetary donations for their facility. KNOWLEDGE IS POWER, let&#x27;s help somebody. DONATE to the Ferguson Public Library which serves the community while schools close. KNOWLEDGE IS POWER, let's help somebody. DONATE to the Ferguson Public Library which serves the community while schools close. Just donated to Ferguson Public Library and Mrs. Robinson&#x27;s class at Central Elementary School in Ferguson. Won&#x27;t you join me and donate? Just donated to Ferguson Public Library and Mrs. Robinson's class at Central Elementary School in Ferguson. Won't you join me and donate? Full disclosure: I also tweeted a call for donations. Author Neil Gaiman and the Reading Rainbow account both tweeted their support for the campaign. Other authors, like John Green, chose to retweet others in support of donating to Ferguson Library. Libraries are famous for squeezing every dollar, making the most of what we have. This will greatly enhance our limited budget, opening up options to help the community, build more community-focused programming, and make some long-overdue updates to our offerings and infrastructure. I don't feel comfortable sharing how much we've received yet, in part because it just doesn't seem real yet, but I can say that over 2,000 people have donated, that the figure is 5 digits. What I hope is that I can hire a full-time children's/programming librarian because of these efforts. Right now, I'm the only full-time person at the library, so my capacity for handling programming is limited. With a second, specialized librarian, our power to help the people of Ferguson will increase many times over. The Ferguson Public Library will be open again tomorrow from 9 a.m. to 4 p.m. Donations are still being accepted on its homepage here.